If you're doing more substitutions than not, you may appreciate being able to mark the occasional GROUP! with the backslash as a "do not compose" indicator. The TAG! has to be given literally between the COMPOSE and the expression you want to compose. (This is a requirement for <skip>-ability. But you can pick any tag you like. Currently it is matched case-sensitively. For now this is limited to just TAG!. It could be other inert types (like ISSUE! or TEXT!) but there doesn't seem to be a great reason to encourage that. And given the existence of the TAG!-based composition if you need it, I'm wondering if that might actually be preferable for COMPOSE. Generic escaping of this nature is more useful than it might look--for reasons that you don't really appreciate until you start doing "hard things". And as I mention, one of the nice things about working in a "template" style is having the things you intend to look as they will in the output be "as-is". The peel-one-escape-level-off is a bit of a curveball, and tagged compose seems to achieve the goal without that curve. (and also, welcome @LkpPo ... and feel free to chime in on any post you like, here or on SO chat)! I will read and like. I tried to reply on a topic about SWITCH, but it's locked or I can't post with a newbie profil on the forum. I'm read time to time the trello board. I appreciate what you did for a better rebol. I have not yet founded the time to learn Rebol. I tried but not have the whoa flash yet. Maybe it's because Rebol is very different. On the roadmap, for useful programs, I thinks UTF-8 is really important. I tried to reply on a topic about SWITCH, but it’s locked or I can’t post with a newbie profil on the forum. I'm not the forum administrator, and he seems to be gone on holiday, but I can ask about it when he gets back. I appreciate what you did for a better rebol. Thanks! It is a work in progress. Not every change has turned out to be good, but many have. I'm not afraid to update it if a better idea is found--or even just go back to how it was. Me too. And if you look at the popularity of encodings UTF-8 seems to have already won. If you are trying to build a simple system, it seems one that didn't need to support anything other than UTF-8 internally would be the future. This is believed by The UTF-8 Everywhere Manifesto. 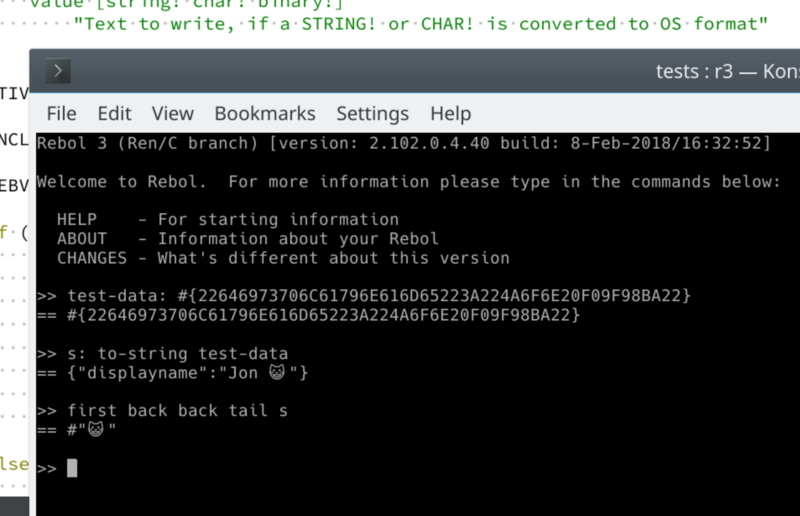 I have not yet found the time to learn Rebol. If you can, please join StackOverflow and ask a question or two. We can upvote you and you can join the chat. It's a unique experience--I think--to be able to come and be a big part of the design of something novel. And possible for someone to make a big impact, if they wanted to! Ok, I will join SO in some days. I thinks Utf-8 only is probably the future of encoding. The convergent movement of Windows and Linux Subsystem will erode the last bastions.